Growing Broccoli is easy. It's a member of the same family of plants as Cabbage, Cauliflower and Brussel Sprouts (Brassica family). It's a cool-season vegetable that prefers its temperatures on the cool side. Broccoli has shown in many studies that it and other members of the Brassica family produce a cancer-fighting substance called sulforaphane. 'De Cicco' -This early-maturing, open-pollinated European heirloom produces small heads and abundant sideshoots ideal for freezing. It is less uniform but also more productive than most hybrids and may be planted in spring or fall. 'Everest' - Resistant to head rot and downy mildew. 'Green Comet' - Resistant to downy mildew & heat tolerant. 'Green Goliath' - Developed especially for home gardens, this open-pollinated variety produces reliably good-size heads and sideshoots for either spring or fall harvest. Heads mature over a 3-week period. 'Green Valiant' -Resistant to head rot. Performs well in spring and fall. 'Italian Green Sprouting' ('Calabrese') - This open-pollinated heirloom variety, brought to the United States by Italian immigrants in the late 1880s, is still treasured for continued side shoot production. Plant in spring or fall. 'Minaret' - This uniform-growing, open-pollinated Romanesco type has light green, pointed spiral clusters and nutlike texture good for salads and dips. 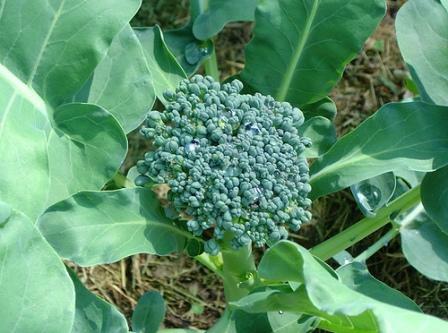 'Packman' - This tender, early hybrid broccoli is widely adapted to different climates and soils. Abundant side shoots prolong the harvest. 'Premium Crop' - Resistant to downy mildew & heat tolerant. 'Purple Sprouting' - Plant this open-pollinated heirloom in mid-May for a late-fall harvest. In mild-winter climates, plant in fall to over winter for spring harvest. 'Waltham - Producing a medium-large head and having good side shoot production, this open-pollinated classic is a favorite for fall crops.